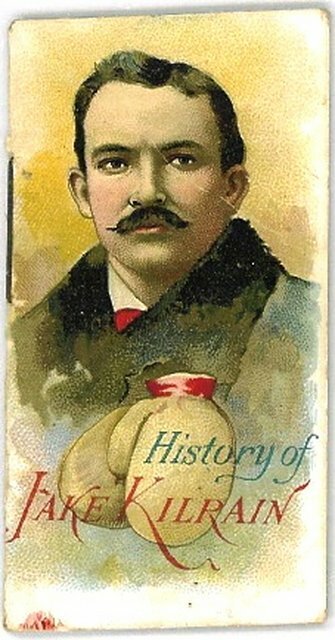 1889 History of Poor Boys and Other Famous People (N79) Jake Kilrain: Although not really cards, the two booklets in this series that depict boxers are popularly collected by 19th century boxing card collectors. The booklets were produced by Duke and show various Duke products in addition to detailed biographies of the celebrity subjects. The elaborate cover art is what makes these items popular among collectors. The two boxer subjects are John L. Sullivan and Jake Kilrain. The set is popularly treated as an 1888 issue, but that is clearly wrong; the last paragraph of the Kilrain biography states that he and Sullivan had signed in January 1889 for a July 1889 championship bout.